Dappled by early morning sun, two rose bushes sit side-by-side against the white picket fence in the southern bed, gracing the air with gentle fragrance and memories. Last year I wrote about the importance of the old-fashioned rose in my garden. Each year I look forward to the blooms. They are early this year by eleven days and as welcome as ever, these beautiful roses, passed-along and carried along deep inside of me. 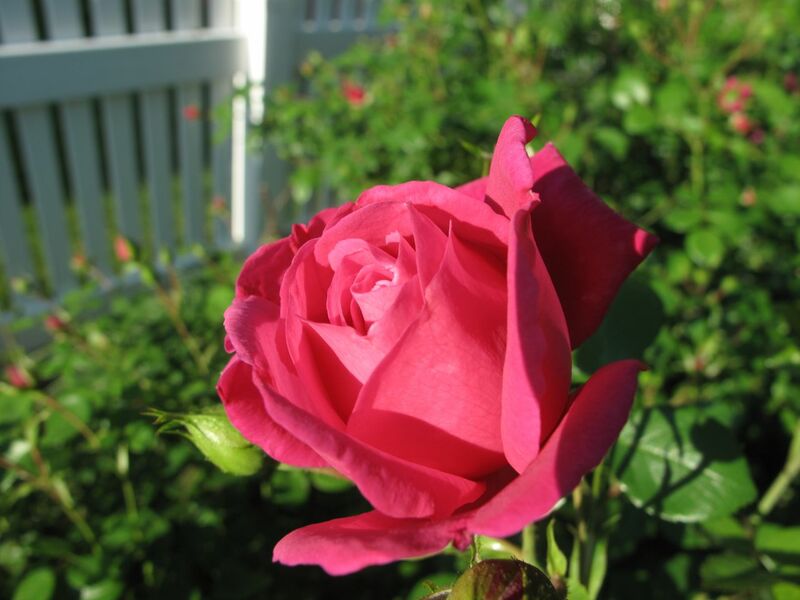 This entry was posted in garden and tagged memory garden, old-fashioned rose, pass-along plant on April 17, 2012 by pbmgarden. The first ones are the best! We are still looking forward to our roses. Here they have only just started into growth. We have mostly David Austin roses as he lives not far from us so we visit and collect them. His own garden is wonderful. That is so awesome to be near David Austen’s gardens. I look forward to seeing your roses as they develop. I must agree with you about old-fashioned roses: the month long flush of sweet-smelling roses far exceeds a few paltry ones all season. And, for those gardeners who suffer Japanese beetles (mine arrive promptly July 5 each Summer), the roses are not destroyed by bug infestation like my Iceberg roses are. Kudos to you to championing the old-fashioned rose.